A 3,000 years history provides Tunisia with an exceptionally rich legacy. Tunisia has a wide variety of historical settlements, Punic, Roman, Byzantine and Islamic, many of which are in excellent condition. 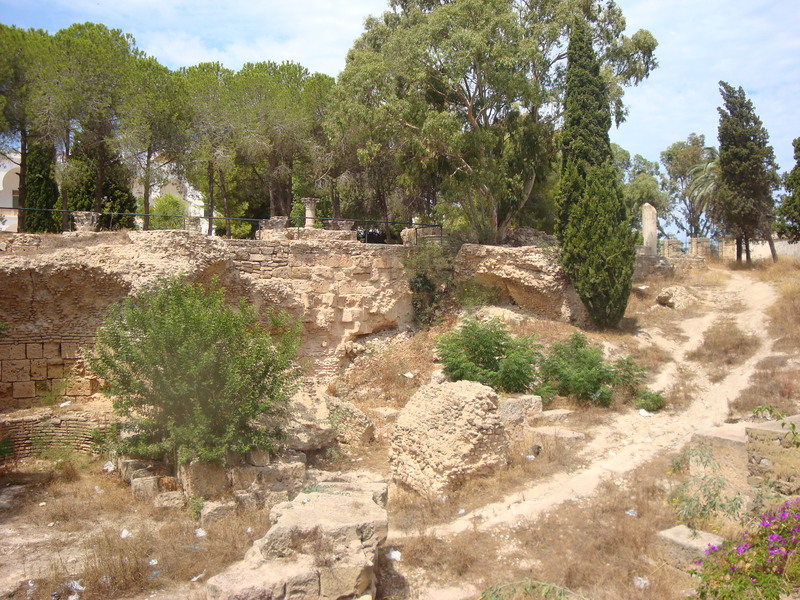 Legend tells how princess Dido founded the city ofCarthage in 814BC. The Carthaginians grew in power until they became major rivals with the Romans for dominance of the Mediterranean. Led by Hannibal, the Carthaginians finally lost the last Punic war defeated by the Roman army that conquered Carthage in 146BC. They razed and ploughed it into the ground. Later they rebuilt the city, making it their provincial capital of North Africa. After 700 years of rule, Roman influence was replaced by that of the Vandals and later the Byzantines. 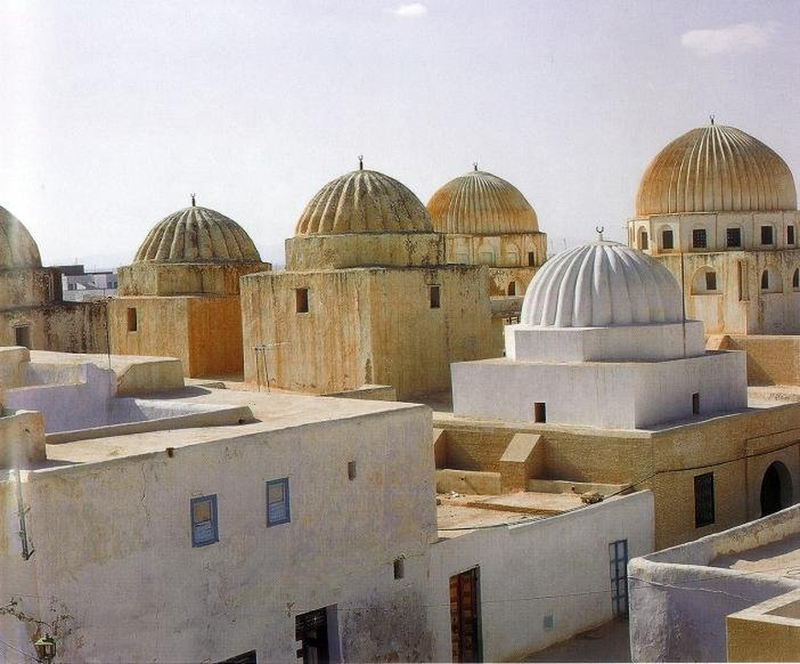 In 670AD, Muslims invading the Byzantine kingdom founded the city of Kairouan, which became the Arab capital of Tunisia as well as its political and religious center. 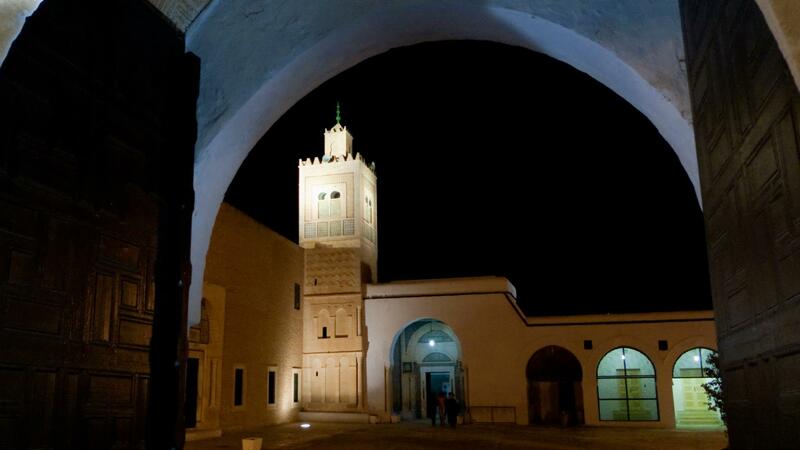 Kairouan is the fourth most holy city in the Islamic world – after Mecca, Medina and Jerusalem. According to legend, seven visits to Kairouan equal one to Mecca. The courtyard in front of its Great Mosque (which can be visited by non-Muslims) is said to be able to hold 200,000 pilgrims on holy days. In the following centuries, five Arab and Ottoman dynasties enriched the Islamic heritage of Tunisia until it became a French protectorate in 1880. Tunisia gained its independence in 1956. The Aqueduct that extends from Zaghouan to Carthage. The El Djem “colosseum” which outer walls are 120ft high and could receive 30,000 people making it the second-largest in the world only to Rome’s. Chemtou, Utica and Oudhna are other archeological sites that provides Tunisia with a great legacy. During the days of the Roman Empire, between the second and sixth century A.D., some of the most spectacular mosaics in the history of art were created in Tunisia. 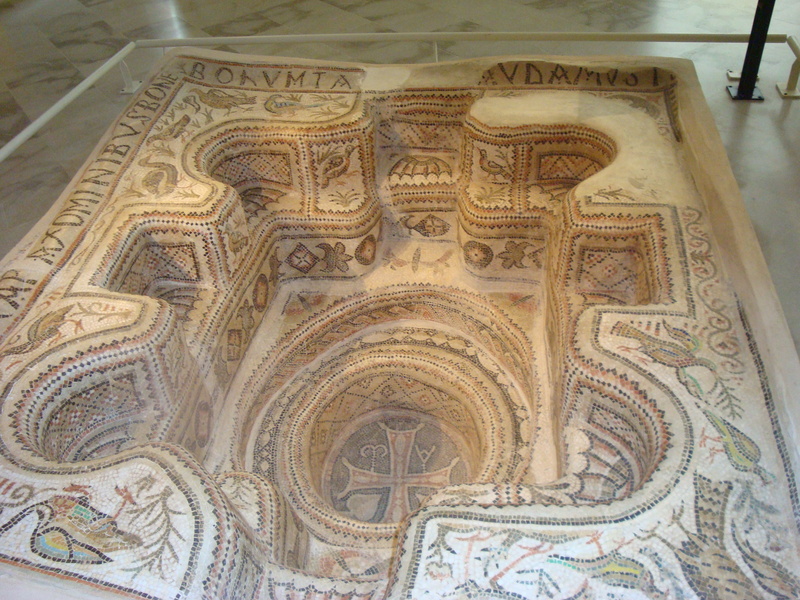 Many extraordinary mosaics are still in place at archeological sites in Sousse, ElDjem, Nabeul, Thynaas well as currently held by museums across Tunisia. 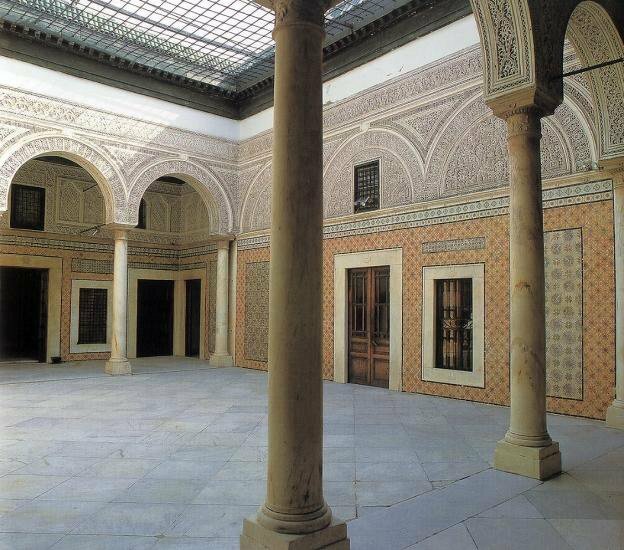 Designed and produced by workshops staffed with master artists and skilled artisans, the floors were commissioned by provincial aristocrats seeking to display their social status and opulent life. The mosaics abound with images of exuberant plant forms, with animals both real and imaginary and with individuals-nobles, farmers, hunters and wrestlers- going about their daily activities. Watching over them are various divinities, Neptune, Venus…. As few paintings survive from this period, mosaics remain the richest legacy of the magnificent lifestyle enjoyed in Tunisia at the beginning of the millennium. These works of art offer insight into the lives and desires of those who lived in their midst, and inspire the same visual delight they surely elicited when first created. 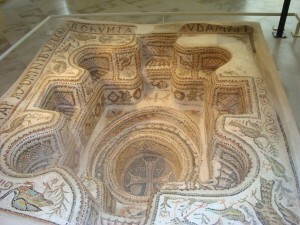 Inaugurated more than a century ago, the National Museum of Bardo is the oldest museum in Tunisia. It comprises several departments: Prehistory, Antiquity, Roman, Christian, Muslim eras and is well know worldwide for its vast collection of mosaics. Housed in what was once the Bey’s palace, it contains important Carthaginian, Roman, Byzantine and Arab treasures. The National Museum of Carthage, located on the hill of Byrsa, contains extremely interesting mosaics collections, objects in molten glass, masks, Punic, Roman and Byzantine exhibits and stands over the remains of the Baths of Antoninus. Many small museums reflect Tunisia’s rich muslim heritage like Dar Ben Abdallah, a palace of the 18th century located in the heart of the médina of Tunis, that shelters the museum of arts and popular traditions. Muslim architecture is most visible today through large monuments such as the great mosque of Kairouan or the Zitouna mosque in Tunis and the Ribats of Sousse or Monastir. Tunisian’s architecture also has Ottoman and European influences. More than 5000 known archeological sites, large and small, bear witness to Tunisia’s great past. Seven of these are among the most impressive in the world and have been designated World Heritage Sites by UNESCO. These include the ancient sites of Carthage, Kerkouane, Dougga, and the amphitheater of El Jem. Early Islamic sites include the medinas of Tunis, Sousse and Kairouan. Many of the other sites lie known but unexcavated, not solely for lack of funding but also in the desire to preserve them for posterity. Excavation invariably means exposing ruins to the elements and further damaging them. To commemorate the lives lost in the North African battles of World War II and in the hope of preventing another word war, there are 12 war cemeteries. Nine British, one French, one American, and one German. The American Cemetery at Carthage gathers the dead not repatriated from the North African Campaign, where nearly forty percent of the losses occurred. It also contains a memorial to the thousands of missing soldiers. This beautiful cemetery is extremely well-cared for and contains detailed mosaic maps illustrating key North African battles of the war. The nine British cemeteries contain 9,704 dead from the Commonwealth countries. They are scattered throughout Tunisia at Tabarka, Béja, Bizerte, Borj El Amri, Oued Zerga, Enfidha, Sfax, Thliba and Medjez El Bab, which is the site of the largest cemetery. The history of Tunisia begins with the arrival of the Phoenicians in the twelfth century B.C.In the Seventh century B.C., the city of Carthage became the greatest of the Mediterranean cities. Its prosperity aroused the envy of the Romans, resulting in a duel to the death lasting more than a century. It ended in 146 B.C. with the annihilation of Carthage. The country later flourished and prospered under the direct administration of Rome. A large number of cities sprang up, such as Thugga (Dougga), Thysdus (El Djem) and a rebuilt Carthage. In the seventh century, this ancient civilization collapsed beneath the onslaught of Arab invaders. This conquest marked a decisive turning point in North Africa. From that time, this part of the world belonged more to the Muslim East than to the Latin and Christian West. 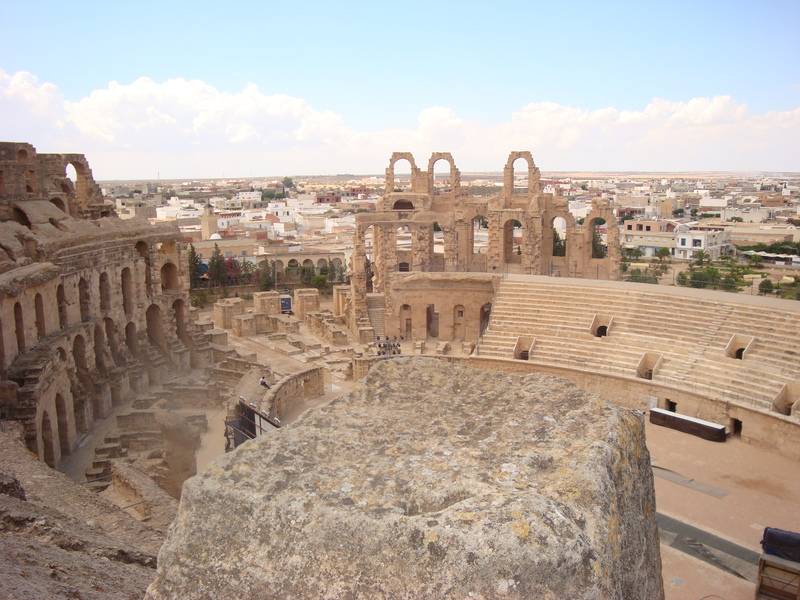 Tunisia history continues through the Aghlabite dynasty, on through two centuries of anarchy, through the Hafcides dynasty, up to and including the 20th century. 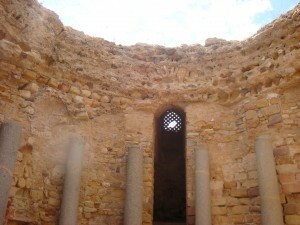 However, it is the remnants of a civilization with a long past which is the focus of PromoTunisia’s cultural journeys. We invite you to undertake a fabulous journey to Carthage, Thysdrus, Dougga, Bulla Regia, Kairouan, and Tunis. Unhappy Didon for whom a cruel destiny waits. Her brother Pygmalion has killed her husband Siché; she has left her country, Tyr, the pride of the Phoenicians, of whom her father is King. She has alighted on this coast and founded Carthage. Now the handsome prince, Aeneas, escapes to Africa. Didon falls in love. But the Gods have decided otherwise and whilst Aeneas is sailing to Italy, the Queen stabs herself on her funeral pyre. In the following centuries, through bloodshed and destruction, Carthage extended her empire and her commerce. She was the Venice of Africa but even crueler, with babies constantly sacrificed to the insatiable Gods, Baal, Amon and Tanit. Carthage was getting tougher and tougher, but Rome was resisting and defeated them in 241 B.C. in the first Punic war. From the desert, the Numides, ancestors of the Berbers, who had formerly surrendered to Carthage, were beginning to revolt led by Hamilcar. It was a massacre. Then came the famous epic of Hamilcar’s son, Hannibal: the Spanish legions crushed outside of Cannes, Italy invaded, Romes’s retort, Scipio being sent to Africa, Hannibal compelled to follow him and finally in 202 B.C. the Roman legions entering Carthage. The city was brought to its knees. Never again was it going to cause trouble to Rome. But Massinissa, the king of the Numides, had not forgotten his people’s anguish. Patiently, he began to gnaw at what was left of the Carthaginian Empire. Rome wished to finish it and Caton never ceased to repeat passionately “Carthage must be destroyed”. It was the final quarry. In the spring of 146 B.C., the city was razed to the ground, district by district, house by house. Those of the inhabitants who escaped extermination were led off to slavery. On the eve of that terrible day there had been 700,000. Rome had destroyed, Rome would rebuild. The very soil of Carthage has been described as “curse” but just a century later, Ceasar then Pompei were to resurrect the city. 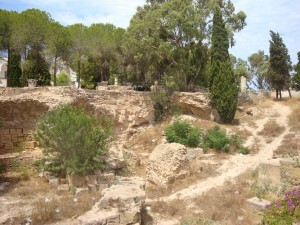 Carthage attracted many of rich families from Rome. It was the capital of Africa, a luxurious capital full of life, learning and pleasure, of monuments and libraries. Her newfound glory was to continue for five centuries. Then came the Vandals who rather than destroy the city made it their capital. In 534 A.D., the Byzantines offered Carthage to their emperor Justinian. They were to keep it for one and a half centuries. Then from the depths of the desert, the mounted Arab troops of Hassan Ben Nomane descended on the city and for the second time, Carthage was destroyed. Less meticulously then the first time because even today, around the summer houses of the Tunisian bourgeoisie, sufficient ruins remain, for us to imagine some of the pomp and splendor of this imperial city, once the third Roman city after Rome and Alexandria. Thysdrus, was in effect, one of the wealthiest cities in the third century A.D.; Gordien elected himself Emperor here in 238 A.D. One can imagine as we enter the amphitheatre with its three tiers of arcades, the cruel games which must have taken place on this occasion. 30,000 howling spectators standing in the stone galleries, cheering the gladiators and hooting the vanquished. One can also imagine the strange silence which fell on these stones once the Romans has departed. In the 7th century, it seems that a furie took refuge there. Kahina, the Berber’s Joan of Arc, prophetess and warrior, who launched her men against the first Arab horsemen, devasted the provinces far and wide but gradually was to retreat village-by-village, defeat-by-defeat. At the end of the 17th century, the amphitheatre was still intact. Then a mass rebellion broke out in the region. The rebels dug themselves into the Coliseum at the Djem and it was necessary to breach in the side of the building in order to dislodge. Once broken, the marvelous monument was no longer a fortress. People rushed to take away the stones of this ill fated arena. The wall, which crowned the edifice, crumbled and the arena was covered with debris. It was not until the 20th century that some order began to take shape out of all the chaos. During the restorations, subterranean chambers lining two long arched galleries were discovered: the rooms where the Romans kept the Christians and the wild beasts. In 670, for the third time in thirty years, the Arabs who had subdued Egypt, invaded Ifriquiya (Roman Africa which had become a Byzantine province). This time they made just one excursion but it was a serious one: conquest followed by occupation. A great soldier, Oqba Ibn Nafi led them to victory. The Arabs had wider plans; they aimed to subdue the whole Maghreb region. Oqba needed a base to operate from. A base well placed in the interior with an Islamic capital that was not rooted with foreigners. The famous historian of the 14th century, Ibn Khaldoun, tells how Oqba decide on Kairouan: his armies arrived one day in front of an impenetrable wood “this is what we are looking for” he said. But his companions cried out against the choice saying that it was not only swampy but also overrun with snakes and wild beasts. So Oqba gathered up the 18 members of his ranks who were followers of the Prophet and ordered the animals to disappear, which they did. At this, the rest of his men, formerly Berbers became Islamic converts on the spot. 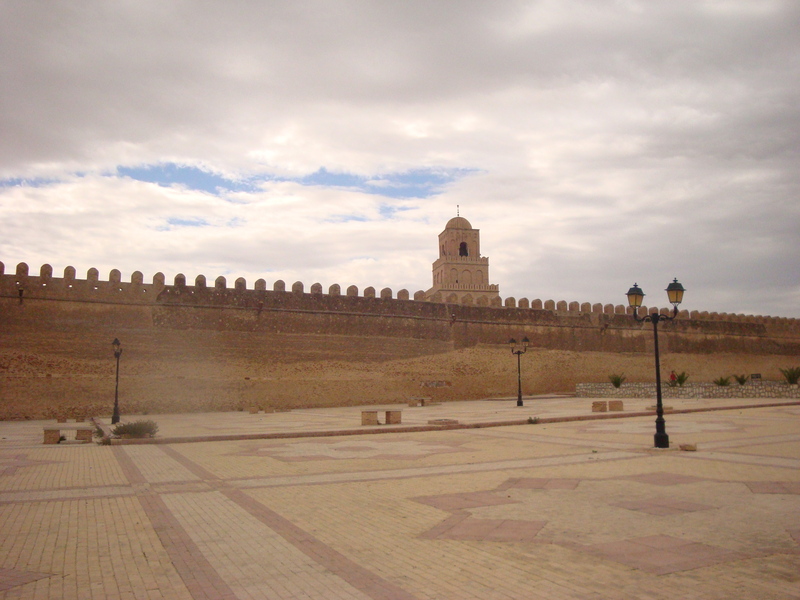 At once, Oqba outlined the foundations of Kairouan. In 800, an Arab chief, Ibn el Aghalab took away from the Califs of Baghdad, sovereigns of Ifriquiya, the title of Emir and bestowed it on himself. The Aghlabite dynasty was born and it was going to continue in its splendor for a century. Kairouan adorned herself with ramparts, gardens, monuments and admirable mosques. The holy town became a place of pilgrimage. In 910, the Berbers seized Kairouan and established the Hafcides dynasty in Ifriquiya. This regime was to last more than three centuries. But the reign of Kairouan had ended, that of Tunis was about to begin. The thing left to Kairouan is her spiritual side, a reputation for being a great religious center. Even today, seven pilgrimages to Kairouan are equal, in the eyes of the believers, to one trip to Mecca. Until the VIIth century and the Arab invasion, Tunis was overshadowed by Carthage. Spared by the Byzantins and the Arabs, she grew, while Carthage was dying a slow and agonizing death. By the time the crusades arrived, she was a proud and powerful city. The siege was to end after a month with the Death of Saint Louis in Tunis. A treaty dawn up at the time and always scrupulously adhered to, gave to the Christians the right to have their churches there and to trade on the same terms as Muslims. Under the Hafcides, Tunis was to live her golden age. A city of 100,000 people, which intellectually and religiously rivaled with Cairo and Baghdad. In the redoubtable fortified port, the corsairs brought back to their sultan the captured Christian ships. In the medina, where each guild had its own souk, all the Mediterranean people (Spaniards, Jews, Venetians, Marseillais and Genoans) trade together in mutual tolerance. But the beginning of the XVIth century saw the arrival of the dreaded Barberousse brothers who sieved the Mediterranean of its treasures and took Tunis for their masters, the sultans of Constantinople. The power of the Hafcides had reached its end. But the troops of Charles Quint, chased the Turks in full force and re-established the Hafcides prince Moulay Hassan. This was the best way of keeping him under control and for thirty years, Tunis, where Cervantes was to be stationed, was a Spanish protectorate. At the end of the century, the Turks returned and installed a Bey who founded the first Beylical dynasty. In 1705, the Bey broke away from the Turkish Empire, then in decline, and reigned until 1881 when the French protectorate was established. On the 20th March 1956, the French government recognized the independence of Tunisia. The Bardo museum in Tunis is considered as one of the richest museums in the world. Housed in one of the former Husseinite palaces, it encloses all the treasures of Tunisian history: from pre-historic times to Punic civilization, to the roman era,to christianism times, to muslim civilization and up to the twentieth century. Poor Ulysses. What Homer described is the Djerbian Odyssey. What could these irresistible fruits have been? Doubtlessly, they were dates. Djerba is connected to the mainland by a roman causeway. It is isolated more by the desert than by the sea. This geographic situation has made the island, through centuries of history, an important crossroad between the Mediterranean and Africa. The charm of the island is made up of a fragile balance of natural elements. A spectacle of palms, olive groves, gardens, dunes, chalky white silhouettes of mosques, cylindrical minarets, high thrusting towers and squat marabouts. The central city of Houmt Souk consists of souks, traditional shopping area, old arcades, moorish cafes and picturesque markets.